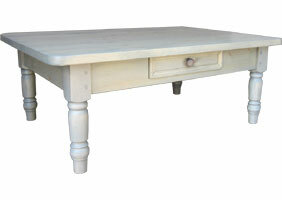 The Turned Leg Coffee Table is four feet wide and has turned legs with one drawer. The legs are turned from a solid block of wood and have a ball detail at the foot. The drawer has a mitered raised molding and runs on wood runners for ease of use, the knob is wood. This Farmhouse Turned Leg Coffee Table is about to become the family meeting center—play board games, snack on foods during the big game, or just relax with your feet up watching TV. 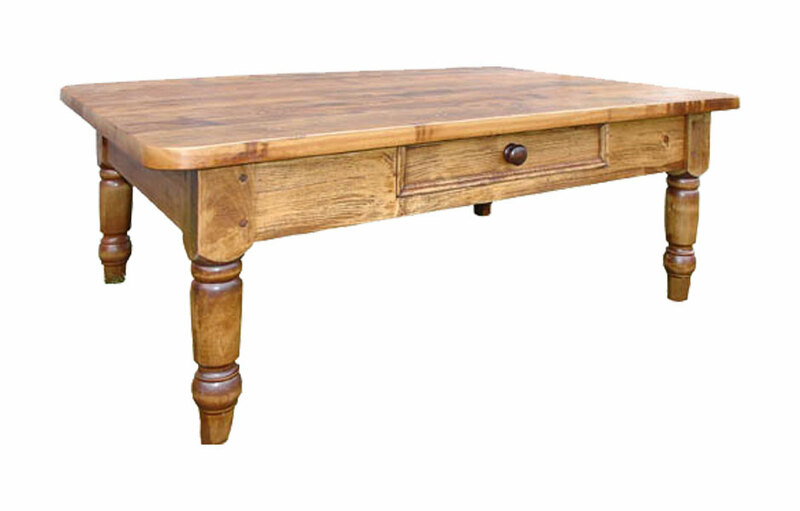 The traditional turned leg coffee chest brings function, durability and French country style to your living room. 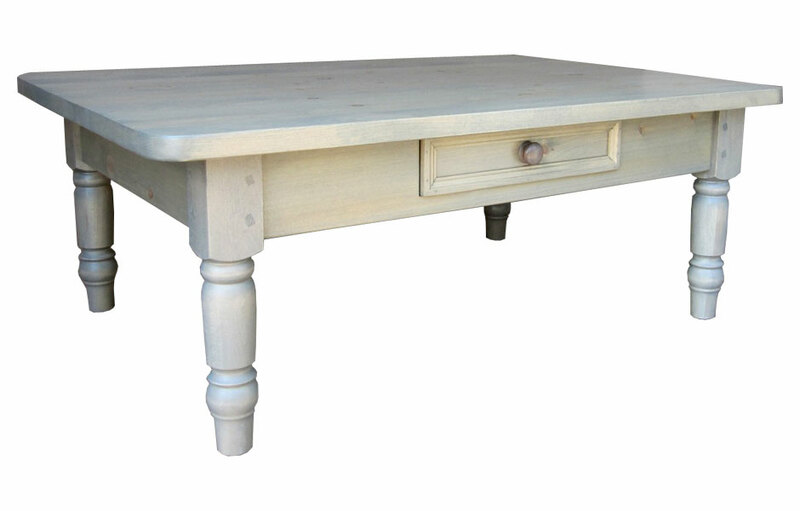 The French Farmhouse Turned Leg Coffee Table has turned legs with one drawer. The legs are turned from a solid 3" block of hardwood and have a signature ball turning at the foot. The drawer has a bevel molding detail with a classic wooden knob. The drawer runs effortlessly on wood runners for years of daily use. The top is stained to highlight the natural beauty of the wood grain. The base has mortise and tenon joinery for enduring strength and stability. The 4ft. width is an ideal length in front of a large sofa. The 34" depth is generous enough to organize magazines, and decorative items on the top. The 18" height is perfect for those cozy evenings of watching tv with feet up. The drawer hides clutter and provide lots of storage room for remotes, tablets, cards and games. The cocktail table can be painted in a classic two-tone finish with a stained interior and top with painted exterior, or all-over one color finish. 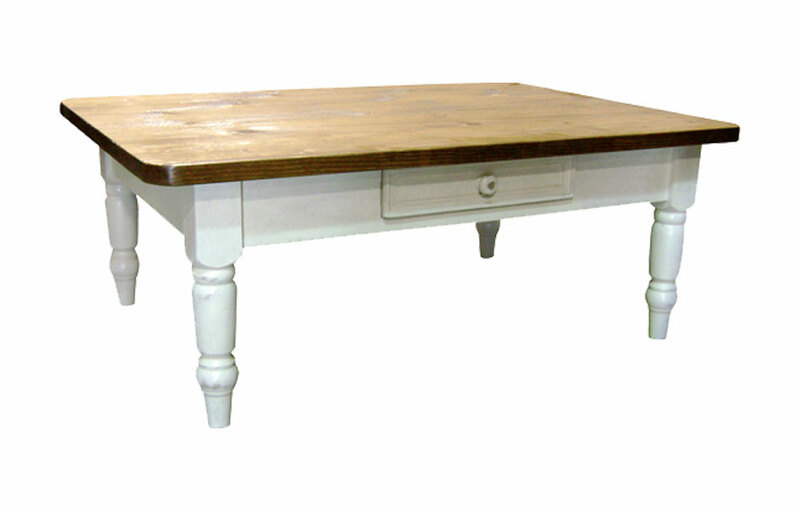 The Farmhouse Turned Leg Coffee Table with drawers and bun feet complements French Country, English Cottage, Farmhouse, Rustic, Transitional and Traditional style decors. 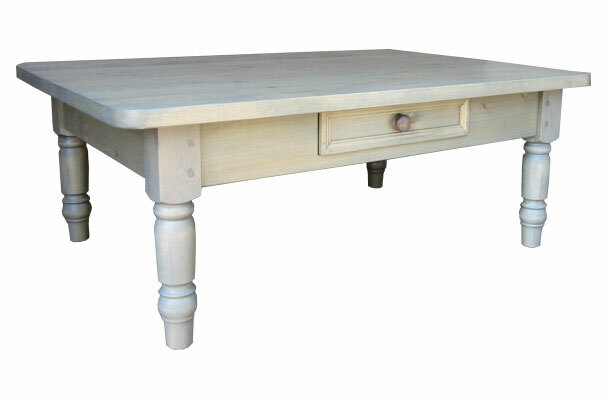 Turned Leg Coffee Table with 3" legs, 48" wide, with one drawer finished in gray stain.